A newly create instructional guide is now available online. All acolytes should familiarize themselves with it. The guide will be updated regularly so check back often. 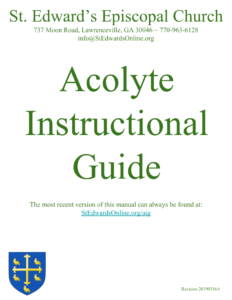 Acolyting is not just for kids! Have you ever wanted to serve at the altar during service? Please come join us for our training session and become a part of our St. Edward’s Acolyte Ministry. All adults and youth are invited to join us for Acolyte Training. All current and aspiring acolytes are asked to attend. The role of acolyte has a rich history dating back to 252 A.D., assisting with the preparation of the table. Today, acolytes play an important part in all aspects of the worship service. They are part of the procession in at the beginning of the service and out at the end. Acolytes may also assist with preparation of the altar. Serving as an acolyte is very rewarding. 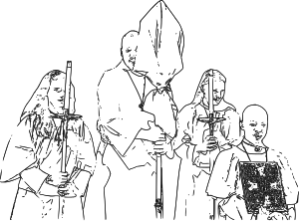 Any confirmed member of the church can be an acolyte, regardless of age. Regular training sessions are held throughout the year.